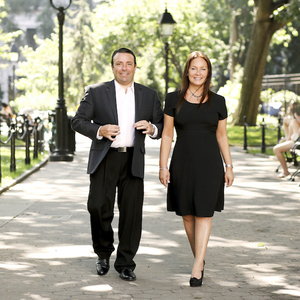 Elise and Harvey joined forces in 2011 to create The Roberts Messing Team, a motivated and successful partnership combining hard work, persistence and extensive knowledge of Manhattan residential real estate. Working diligently with buyers, sellers, renters and investors, The Roberts Messing Team is able to tailor their approach to assist each client with their particular wants and needs. The most rewarding complemint is their repeat business. Through referred customers, Elise & Harvey make sure to stay in touch even after the deal is closed as this isn't only about business; it's a personal relationship that remains. Elise has been an Associate Broker since 2002. Prior to finding her home in real estate, she graduated from The University of Miami and then received her Masters at New York University and taught elementary school. Harvey, after much success as a restaurateur, brought all of his acumen to find his absolute passion in New York real estate. Born and raised in New York City, he has a personal connection with every neighborhood and has witnessed all the amazing developments first hand. He is the ultimate New Yorker. Elise is a designated member of the elite NYRS New York Residential Specialist affiliation and Harvey served as a board member for five years where they reside. Harvey is also the chapter president of an distinguished international networking group. They are grateful to be able to contribute and volunteer for many charities and you can find them spinning annually for their main cause which they are passionate about, Sloan Kettering's Cycle for Survival. Not only are they partners in real estate, but also partners in life. They are married with two amazing boys and an adorable dog on the Upper East Side.